As a college student in Japan, I came to realise that I had an unusual attribute: I am a musical/visual synesthete. Not everyone conjures pictures and images when they hear sounds, but it comes absolutely naturally to me – in fact I find it difficult to avoid. Since my youth, I’ve been a musical actress, pianist, flautist and conductor, so the stage is a familiar place for me. 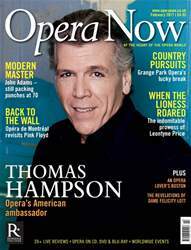 Over time, my attention has been focused more and more on opera, and especially opera directing. After I graduated from a music college in Tokyo with majors in flute and conducting, I moved to Germany to study opera directing at the Hans Eisler Hochschule für Musik in Berlin. And so my long journey into opera began.